Crochet for Cancer’s Basketweave Vertical Stripe Cap - Crochet for Cancer, Inc. 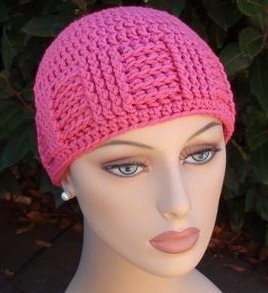 Here is our newest cap called the Crochet for Cancer Basketweave Vertical Stripe Cap. Below is the Free Pattern. We would love to see your photos on our Facebook Page. Design by Tracy Wells – Co-Founder, Crochet for Cancer, Inc. with assistance by Paula Daniele, Crochet Hooks You. Pull center yarn tail to tighten. Rounds 10-15: Ch 2, * 1 FPdc around each of the next 4 stitches, 1 BPdc around each of the next 4 stitches, rep from * around to the last st, 1 dc into last st, join with a sl st into top of ch-2. NOTE: If you need assistance with rounds 10-15, please watch the step-by-step video below by Paula Daniele with Crochet Hooks You, for instructions on how to crochet the FPdc & BPdc stitches. Round 16: Ch 2, 1 hdc into each st around to the end, join with a sl st into top of ch-2. Weave in ends with a yarn needle. Need help with this pattern? Watch a step-by-step video tutorial for this cap by Paula Daniele from Crochet Hooks You. Copyright 2013 Crochet for Cancer, Inc. This pattern was designed for personal and charity use only. Please do not make this hat to sell. You are welcome to post this pattern online however we ask that you give proper credit to Crochet for Cancer and that you link the pattern back to this website. It is forbidden to use this pattern or photos and claim them as your own.